Running color runs is nothing new for my family. Though we’ve tucked quite a few under our belt over the last 4 years, surprisingly we have never participated in The Color Run. Founded in 2012, The Color RunPIN IT! has become the largest 5k event series in the world. The Color Run Dream Tour, Presented by Lay’s®, is sure to release your inner runicorn. You read that right, your inner running unicorn self. You go Glen Coco! The Color Run Dream Tour is a color runner’s dream come true from foam clouds and dream walls to color throws and heart pumping beats. Rolling in to Rawhide Western Town on Saturday, March 25, the happiest 5k on the planet will make your color filled dreams come true. PIN IT!When you enter this magical course, you will be greeted by magically giant unicorns and fluffy dream colored clouds, also known as foam but don’t kill my dreamy vibe. Keep up your pace because those color stations are waiting for you just around the corner to brighten your day. To keep the positive mojo flowing, The Color Run’s new Dream Wall will give you the opportunity to share your dreams with the world. Using spray paint, you can vibrantly scream them loud which is a perfect photo op. Don’t forget to use those #DreamInColors and #Happiest5k hashtags on your post though! After crossing the finish line of this untimed run, grab a snack and get your party on at the Finish Festival. You can shake your bottom with the official Runicorn and turn into a rainbow even further with massive color throws every couple of minutes. PIN IT!With your registration to The Color Run, you will receive a custom race kit. Every race kit includes a Dream Tour race shirt, a Unicorn Finisher’s Medal(YAS! ), a headband, fun temporary tattoos and a runner’s bib for you to uniquely color-in. Get ready for my art folks! Okay, not really. I color like my toddler, haha! Want to add a little more swag to your run? Upgrade your race kit with a deluxe registration package and you’ll receive even more goodies to strut. Want even more? Check out The Color Run store to find lots of fun dream inspired items. Last but not least, the Phoenix run also benefits Banner Children’s, one of the largest medical care organizations in Arizona. This means you’re not only running to release your inner runicorn but running for a cause as well. The Color Run Dream Tour, Presented by Lay’s®, and I have teamed up to give away not one, not two, but four free race entries! That means one lucky winner will receive all four registrations to fill their dreams full of color. Too impatient to find out if you’re a winner? Use The Color Run promo code “WILDISHJESS” to get $5 off your registration. Good luck and I’ll see you out in the clouds! Sounds like fun! If you run, hope you have a blast. Sounds like a fun run. Bummers that there are none in my state. That sounds like so much fun! I would love to do this one. I’m finally in good enough shape that I can do one, and this one looks great. Oooh! I wanna be a runicorn! This looks like it would be so much fun. I think my BFF and I would have a blast! I have a lot of friends that do the color run. They always have the best photos! That’s pretty cool. If you’re going to do a run, it might as well be in technicolor. I would love to do that – it loos like so much fun. Love running and often do 10ks and this is just a happier more colourful version. What’s not to love! I never participated in the Color Run but I have plenty of friends who have! It looks like such an amazing run – they love doing it every year. How fun. I haven’t done a 5K in a long time. This one looks like it’s going to be fun. That looks like a lot of fun, fun, fun out there. It was such a perfect idea since certain colors conjure up different emotions in us. Colors can boost our energy and affect the way we feel, our mood. Anyways, love all your photos. I’ve heard about these color runs. I’m not sure if I’d like it since I’m not a fan of running or getting dirty. But my daughter would want to do it! I haven’t done this one, but I would bring my husband or a friend or both! You would win 4 entries so you definitely could bring both! Oh gosh! I have always wanted to run/walk a Color Run!!! It is on my bucket list!! This looks like it would be so much fun. I will have to see when the next one will be in my area. I am sure I can get a few friends to do it with me. This is a really fun event. I am not a runner, but my two sons love it. I checked on the the website and saw that we will have a Colorrun event in our area in September. I will let my cousin know about this too. 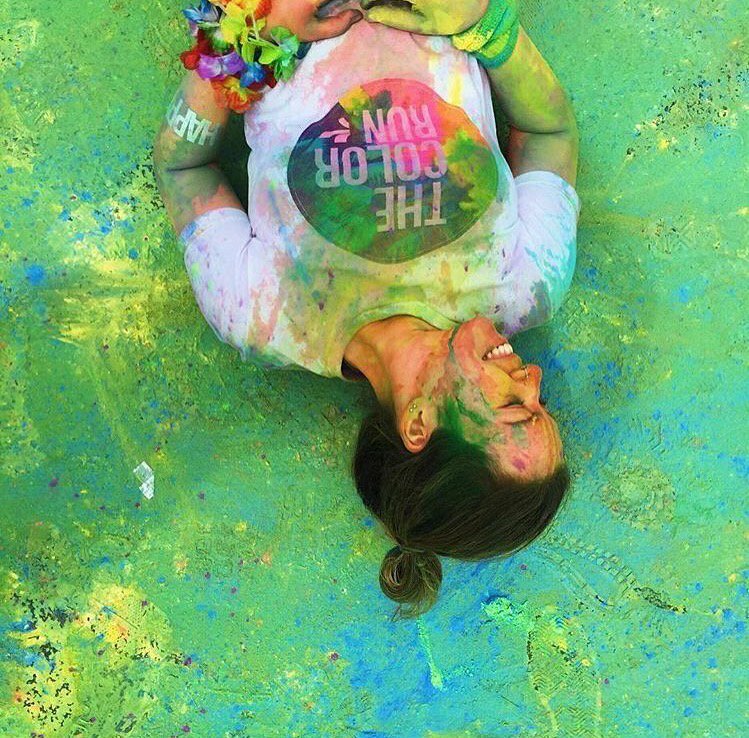 She and her husband can join the Colorrun in May. You definitely should! Don’t forget to enter the giveaway too for free entries! I did a few years ago and was covered in the most blue ever! That’s awesome! I always end up green at color runs for some reason! This looks like so much fun! I’ve never heard of this 5k before, but I’m absolutely in love with the colors, and the unicorns. If I ever went I would love to take my mom – because families that run together stay together! Great job doing this 5k – they can be pretty difficult! OH my gosh this looks like so much fun!! Sign me up! This sounds super fun! I admire people who run. I wish I had the strength and stamina to do this. I’ve seen this a lot but I never once thought of joining it! I would love to though, it looks like a lot of fun! I’m sure my daughters will like this as well, they’re very active. I’m not much of a runner, but the Color Run has always looked fun! I think if I did do a 5k, it would be the Color Run. I really wish that I could participate in a Color Run. It has been several years since I have been able to run. My chronic pain hinders that ability. This looks like so much fun! I bet kids and adults will enjoy themselves. Reminds me of the Indian festival of Holi. This sounds so much fun! Bummer! that I’m not much of a runner. But I wish I could run if not with my injuries. Good luck to all! I have! it was such a blast. I’d bring along my two teenage daughters, what a perfect, memorable way to bond! I have never done a Color Run but I want to. I would bring my daughter and my mom. I’m not a runner at all, but I’ve kind of wanted to be because runs like this sound like soooo much fun!! I have always wanted to do a color run!! Maybe it will come to my area one day soon. This is so cool! Runicorn is very creative way to invite unicorns and sporty people together. I like the giveaways! I will also tell this to my friends. This became really in trend even in other countries. Glad they got medal too. I haven’t but I would love to go with my best friend, Rachel! Omg I know a lot of people who have done color runs!!!! They look like a total blast if running is your thing! I have never participated in this run before. I would love to take my husband, my friend, and her husband along with me if I win! Hey there! This post could not be written any better! Reading through this post reminds me of my good ole roommate! He always kept talking about this. I will forward this page to him. Fairly certain he will have a good read. Thanks for sharing! I keep wanting to do this. I’m not a runner, but it looks like a lot of fun. I need to start walking again so that maybe I will be up for it next year.